War. And the fact that in our country, it won’t be long before those who can tell us about the World Wars first-hand are gone. Tomorrow I am interviewing someone for a video we are making to use on Sunday, and in our preparation chat today I was so struck by the fact that it was a whole different way of life – the war affected the way people shopped, the clothes they wore, what they took to school, whether they learned to drive, how they spent their free time – everything was different. I think it’s so important that we do not forget the wars of the past, the atrocities of the Nazi regime, or those conflicts and troubles that continue to plague our world today. But I think the way to remember is through the personal stories of real people who lived – and are living – through them. It reminds me of the book I read, The Postmistress, which I wrote about here. Christmas. I’m a big fan of seasons! I think they teach us so much in life. There is a time for everything, and this can encourage us in times of hardship or waiting, and can only enhance our enjoyment of times of happiness and blessing. Normally, I’m a bit of a scrooge when it comes to Christmas. It is a season that means hard work for me, and sometimes I struggle to match up what it’s meant to be all about (peace, joy etc) with how I’m feeling (tired, stressed etc). This year, though, I’m really looking forward to it! I’m not sure what’s different, but I’ve got that bubbly excitement that I used to get as a child. I’ve been collecting ideas for work and home on Pinterest. Waiting. As a Christian, I believe God hears me when I tell him my hopes and dreams. I believe he’s made certain promises to me to give me hope and a future. But sometimes, I get tired of waiting and trusting to see how it’s going to pan out. I want to write my story for him, instead of letting him be the Author. I want to make it all happen, as I want, when I want. But if I let God roll out his plan for my life, I know I’ll be amazed at the perfection of his timing and the beauty and intricacy of his provision. It’s still so hard feeling like something is just out of reach, just around the corner though, so I’m praying for patience! 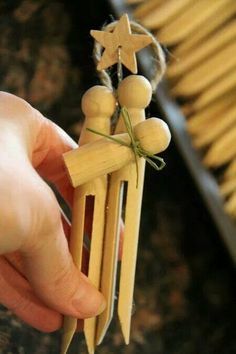 Image found on Pinterest – how sweet and simple is this Christmas craft? !